Each lip piercing offers you the option for many different looks. From the common earlobe piercing to horizontal piercing, there are many popular choices. This method of lip piercing enhances your facial features and can truly make a fashion statement. In this article, we’ll explore the information you’ll want to know about typical horizontal lip piercings, their pain levels, possible scarring, types of jewelry and photos that show off how versatile this piercing is. Your horizontal lip piercing is somewhat rare. It goes fully through the whole lip –generally the lower one. Other types of lip piercings are run straight through the area with the least flesh; most horizontal piercings typically are accomplished with a bar that goes in and out the very same lip. You can have it placed near the corner of your lip or the center. It’s a preferred piercing for men, since women think they look hot. The drawback to this piercing? Going through a relatively large, sensitive area of skin is painful, and the rejection rate is rather high. A lot of this depends on what gauge of needle is used by your professional piercer – who should be the ONLY one you allow to perform this piercing for you. Smaller gauges have an easier cutting effect, while a larger bar gauge will not cut quite as easily, making the piercing more permanent. Each person is different, and the pain levels and healing differ from one person to the next. You should pay special attention to aftercare, to prevent rejection, infection and migration. The care you take with your piercing is necessary and important. Your aftercare needs to include unflavored, non-alcohol mouthwash rinses and soaks with sea salt and warm water. 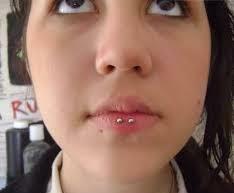 The horizontal lip piercing penetrates through a pretty large area of the lip, so scarring will normally be prominent. Ask your professional piercer what options are best in the piercing process and the types of jewelry that work well. Most professional piercers will charge one price that includes the jewelry and piercing together. This is especially true if you will be having them order you custom jewelry. The curved back surface barbells are ordered at specific lengths, curvature and gauge. This makes the pricing more variable. This is just one more reason you need an experienced, professional piercer. He will know what type jewelry will work for you. Unless you already have a preferred piercer, check out various shops, so that you can compare prices. Make sure that the shops and their instruments are clean, to lessen your risk for infection. Horizontal lip piercings are much like vertical labrets, but done horizontally. However, vertical labrets are popular with people interested in new types of piercing. Horizontal labrets are done with one barbell that goes through the middle of your lip, which gives the look of two random balls that sit close to one another in the mid-lip. Photos 1 – 3 show horizontal lip piercings placed at the lip center. This is how the horizontal piercings are performed. As mentioned before, horizontal labret piercings are done in one side and out the other. Both ends of the barbell will show. You may choose a curved barbell, normal labret or spike. Since this piercing passes through much of your lower lip, your piercer will usually advise flexible piercing jewelry. These piercings may be done as surface piercings, where there are no holes inside your lip. The piercer inserts the needle through your lip with a custom barbell or staple. You may also have him use a curved labret for this piercing. Another method that professional piercers recommend is using two closely situated Ashley piercings using labret studs placed so that they appear to be a full horizontal lip piercing. It mimics the look but without the scarring risk that occurs if surface barbells migrate out. What is the pain level of a horizontal piercing? The pain involved is commonly a concern for people who want this piercing. Some people will assure you that it won’t hurt, but this one does, since your lips are quite sensitive. Everyone has a different threshold for pain, and this affects your piercing experience. Horizontal piercings traveling through lips from one side to the other, rather than into the lip are called surface piercings, and they are more prone to rejection and migration. If they migrate, they may leave ugly scars on the lip. The tissue at the point where a horizontal lip piercing goes through is very thin. That’s why there is a good chance of rejection. This may occur as soon as several days following your piercing. If you have trouble with migrating piercings, your professional piercer might recommend you get 2 Ashley piercings. They will give you the same look with less risk of migration. Scar tissue formation depends on numerous things, including your capabilities for healing and the gauge of jewelry that is used. Having two piercing scars on your lip can seem a bit daunting. As time passes, though, the scars will fade, almost to the color of your skin. You may also use vitamin E or scar fade cream to speed up the fading. This piercing requires much aftercare, particularly in the first few days of healing. You want to prevent the migration of the piercing. Basic care will involve regular rinsing and soaking with sea salts and water to ward off bacteria. Be especially careful when kissing, eating or drinking during the early part of your healing. Next articleCan You Get Pregnant Right After Your Period?